Thinking of painting your kitchen or bathroom cabinets? 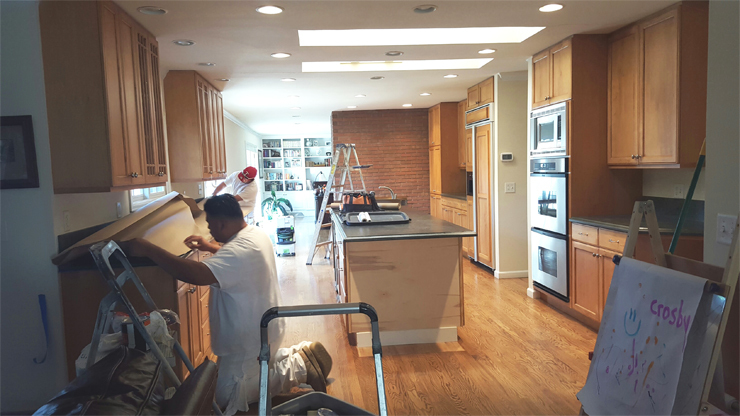 We are the experts in Denver for cabinet painting and have transformed many kitchens, bathrooms and built-ins throughout Denver. 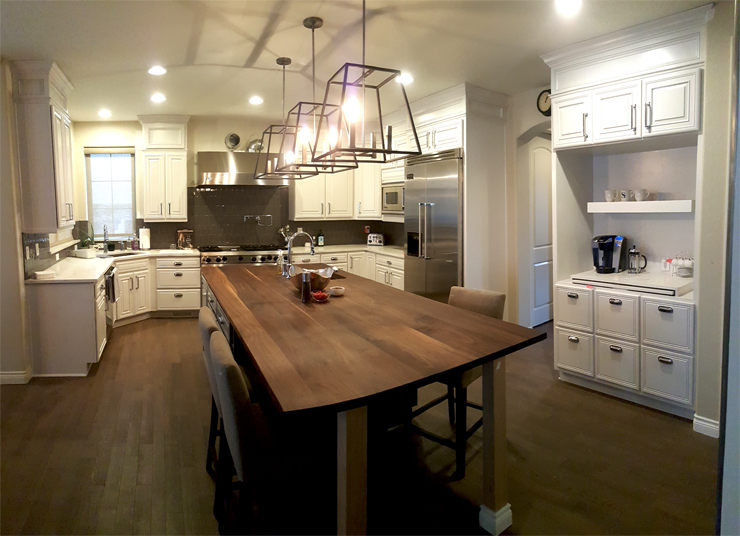 Whether you have builder-grade oak cabinets or beautiful, custom-built maple cabinets, our cabinet painting process will provide you with a factory-like finish that’s durable, looks beautiful, and makes a huge impact in the update of your home. Cabinet painting can increase the value of your kitchen or bathroom at a fraction of the cost compared to replacing cabinets. 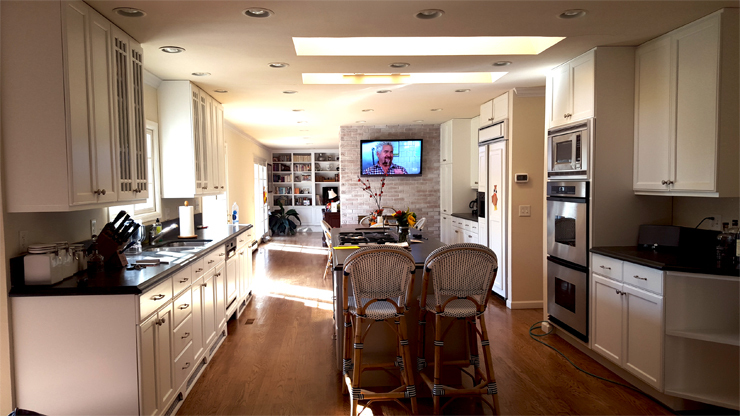 —> Minor kitchen remodels, including updating or painting cabinets have a recent ROI (return on investment) of 65%! That’s over half of your money invested, back in your pocket. Call us now to paint your cabinets! We offer the flexibility to choose from waterborne paints or traditional, oil-based paints. Both are very durable and provide a beautiful, eye-catching sheen ranging from satin to high-gloss. We are now also offering exquisite coatings from Fine Paints of Europe! We are the only Certified Painter in the Rocky Mountain region to offer these incredible paints. You’re one step away from a more beautiful kitchen! Keep reading for a breakdown on our cabinet painting process. Our first step for any of our projects is site protection. We cover and protect all surfaces and finishes not receiving paint. Your cabinets will be the only surface not covered with paper or plastic. This creates a ‘tent’ around your kitchen to contain our work area. Our masking is impressively thorough and tight. 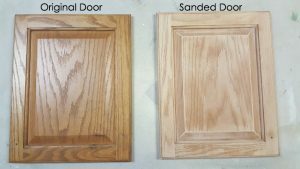 We remove doors and drawer fronts from the frames and boxes, remove all hardware and place them in ziploc bags in their respective boxes for reinstall. All cabinet doors and drawer-fronts are taken off-site to our shop. 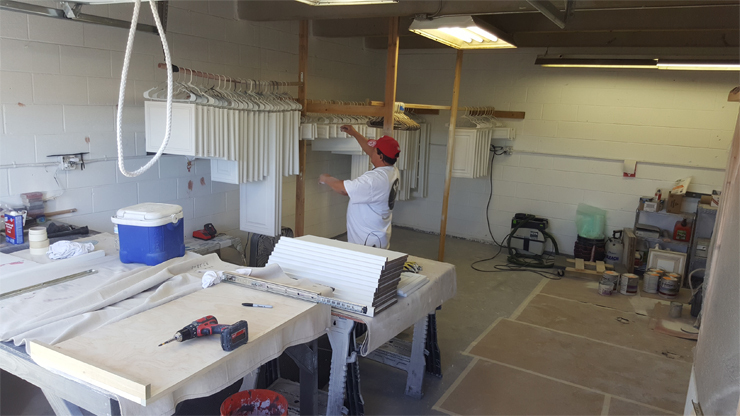 They undergo all phases from prep, to paint, to drying in our shop before being transported back for installation. This allows us to paint your frames and boxes in your kitchen, clean up and move out. Returning your kitchen to you for normal use (without doors or drawer-fronts). This shortens our time onsite to 3-5 days. One of our sanders ready for work! 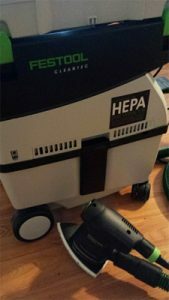 All cabinet surfaces begin with a full sand (HEPA approved, 99.9% dust free!) on all cabinet surfaces using our top of the line Festool sanders. Our sanding goes much deeper than a deglossing agent. As many surfaces as possible receive contact with our high-quality, dust-free sanders. Beveled edges are hand sanded to preserve shape. Our Festool sanders leave a cleaner, better-prepared surface for primer and paint to bond with due to dust extraction. Once masking, cleaning, and sanding is complete we are then ready to apply primer to both sides of doors and drawer-fronts, as well as all boxes and frames. We go one step further and paint the underside of your boxes as well. We do a thorough inspection after our first primer coat to ensure all preparation is complete and meets expectations. When inspection is passed, a second coat of primer is applied. Finally, the paint is ready to be applied. We spray all surfaces with a fine finish sprayer. We apply two coats of paint with a fine sand in between. The result is a beautiful, shiny surface that looks factory-finished. The transformations are dramatic, impressionable and affordable. Update your cabinets today! Call us for a free estimate – (720) 319-6822 or Schedule Your Free Estimate Now!